i was going to write a post today about the ridiculous amounts of snow we've been having, but then the mailman showed up. 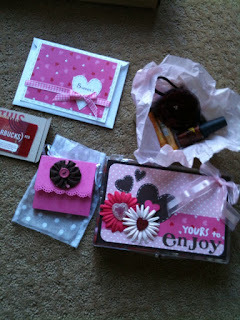 you see, i have been anxiously awaiting the arrival of my simply love swap package from my amazing swap partner jocelyn. i was actually just lamenting to my sister katie today that i was hoping it would get here before valentines day. it literally showed up 5 minutes after katie left my house today. i was on the phone with her (yes i know she had just left my house, but we still somehow ended up on the phone within 5 minutes) when i heard the mailman walk up to the door and hung up quickly telling her that i would call her back. so after almost giving the mailman a heart attack and basically ripping the package out of his hands i ran inside to open it. as soon as i got the package opened i think i starting screaming like a little school girl because gosh darnit, it was just so pretty! see for yourself! so being the good girl that i am i opened the card first (handmade of course) and out fell a starbucks gift card! hello chai latte! then i opened up that cute polka-dotted bag to find a post-it note holder (with post-its inside) which i am pretty sure jocelyn made as well. perfect timing, too because i just ran out of post-its at my desk. hooray! then i opened that cute little box and inside was a bottle of nail polish, 2 burt's bees chapsticks and the most adorable flower headband (handmade again). seriously, is jocelyn amazing or what? so of course i jumped up and put it on and then snapped a picture for you to enjoy. please pardon the messy hair. then i saw it. the holy grail of valentines day gifts. CHOCOLATE! this adorable container (of course once again decorated by jocelyn) was filled with all kinds of yummy chocolate... m&m's, hershey kisses and hershey's miniatures. literally... all my favorite candy! hallelujah! here's a shot of the inside. here's a shot of all my loot! so all that to say- THANK YOU to the best swap partner ever- JOCELYN at Inside Brucrew Life. you made my day... errr week... maybe even year. 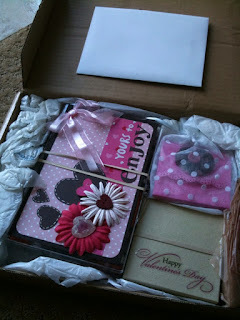 thank you for the time and effort you put into making my package so special! it means so much! and another big THANK YOU to my amazing sister- KATIE at Loves of Life for hosting this swap and helping me to meet such amazing women! i used to really hate valentines day... being single year after year can be tough. this swap gave me something to look forward to! plus i have amazing family who make it special for me. katie and declan are taking me to dinner and a movie tonight, tomorrow my brother jim, his wife kesh and my 2 adorable nieces are taking me to lunch and on sunday night my pastor's wife is hosting a dinner for all the single ladies in our church. i feel so loved! that is the point, right? YES! That is the point :) I LOVEEEEEE your package and love Jocelyn for being so good to you!! Sue, everything is PERFECT and that little box of candy! she is amazing! PERFECTION! I'm so glad I hosted this swap (and..err...you helped me organize all of it!) --you really deserved a great partner! WOW! You made a haul! 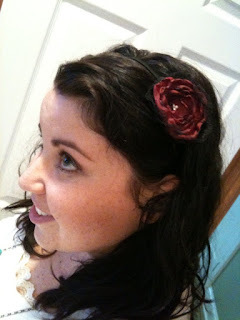 I LOVE that headband! Yea! I am so glad you got it before the weekend. I am sorry I was late sending it:-p I am kind of a procrastinator, but hey I'm also a perfectionist!!! I got mine the other day and just need to get the pics up here!!! I'm glad you liked it all...it was fun to custom make it all for you!!! Looks like a great package! Have a wonderful Valentines Day! Awesome package. 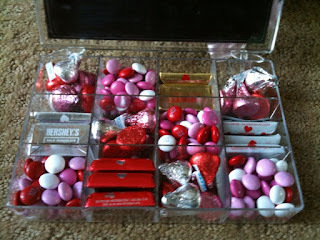 I love the candy holder. The headband is adorable. Wow... you really made out! That's so awesome! Nice! What perfect timing, too! Looks like Mr. Mailman made your day!! Glad you got a box full of fun goodies!! such cute stuff! I love all the handmade items. wow what super cute stuff!